The first literary evening at the Viennese cake shop, Aber House in Barmouth, has come and gone. The cake turned out quite well using a combination of recipes from the web. One Spanish recipe added cinnamon and alcohol but, a bit of a purest, these were left out. However, the recommendation to grind the almonds leaving some texture and then to roast them in the oven to dry out, wholeheartedly adopted. Another recipe, American I suspect, offered a stencil for the cross of St James – or is it a sword? He was a warrior saint after all and claimed by crusading Spaniards wanting to drive out the infidel. (Plus ca change) Only the icing sugar disappointed as it sank into the cake almost without trace before we got to eat it. The sachertorte was chocolately and unctuous, but then I did not make that. 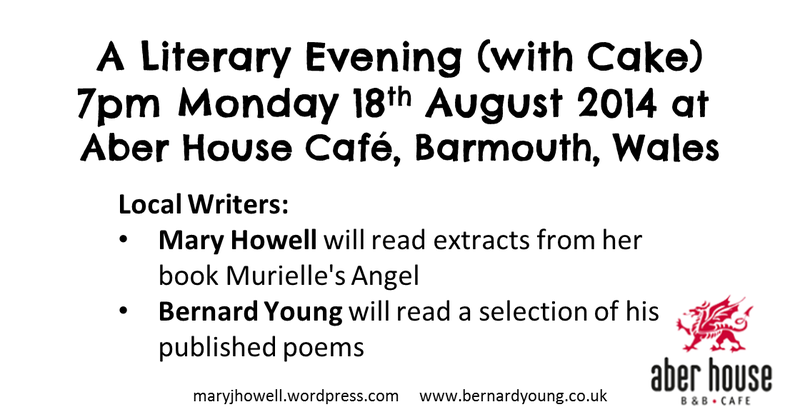 Bernard Young is a performance poet with a light touch, a delight of whimsy and wistfulness. He mostly writes poems for children these days who, one suspects, would love his gentle delivery and humour too. As for Murielle’s Angel? one can only hope and keep putting it out there. There is to be a second evening, with different cake and different readings, but the welcome will be the same. Stories and performance poems go well with cake. Or should that be the other way about? Do drop by if you happen to be about .